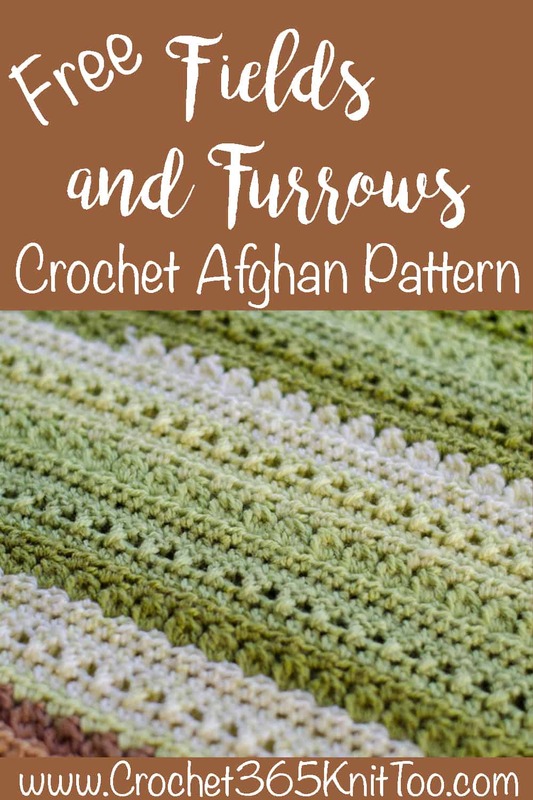 Meet the Fields and Furrows Afghan. 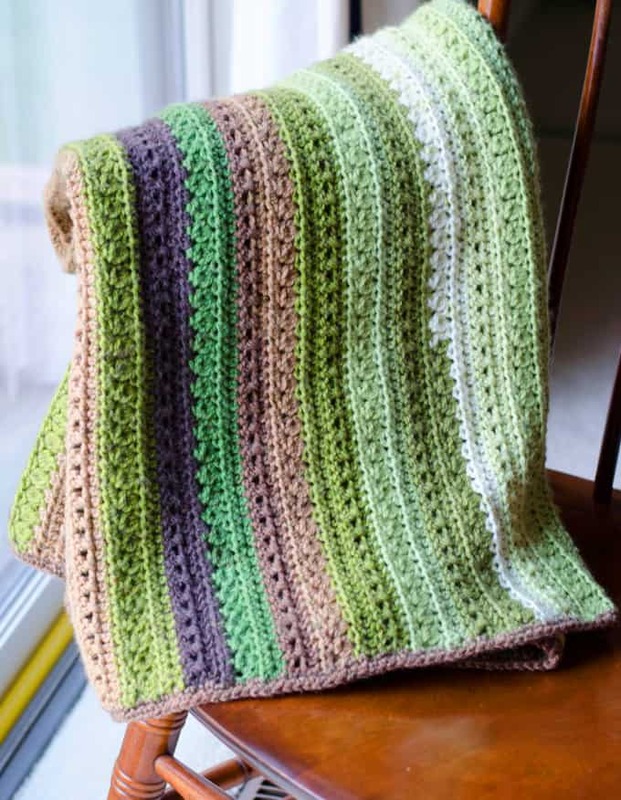 The perfect project for that delicious Caron Cake Yarn you’ve been drooling over! I don’t know about you, but I have a thing for yarn. There’s just something a little special about going into the yarn aisle that makes me smile and fills my heart. And the cake yarn. Sigh. I don’t know what it is about the Caron Cake yarn, but seeing those colors in that fat little organized cake of goodness just makes me happy. And then I think.. what would I make out of it? And I have to admit… sometimes I’m a bit stumped. I wanted a project where I could just crochet away. You know the kind I mean. The kind you can work on while you watch a scary movie–and depending on how things are going you can mindlessly crochet through the intense scenes or maybe pause with your hook in the air, waiting for the suspenseful moment to pass. Or maybe you’re more of an H&GTV kind of girl… you know…crocheting while you watch people demo and remodel their home in an hour. Somehow you feel productive with them except that they are getting dirty and sweating and you are supervising with your yarn and hook. I know. You get me. I also wanted a project that would make the yarn’s color changes in the row less obvious. So I decided on this delightful textured design that is just perfect for the cake yarn. I went with 2 colors (because who can stop at 1 right?) Pistachio Fudge and Pistachio. As you might guess from the name, the Pistachio Fudge has some browns with the greens and the Pistachio picks up some lighter shades. And together I knew they would make the perfect afghan for my hubs. It’s just the right size for snuggling under while watching TV. When the afghan was done and I was taking the photos, it reminded me of a farmer’s field in spring. 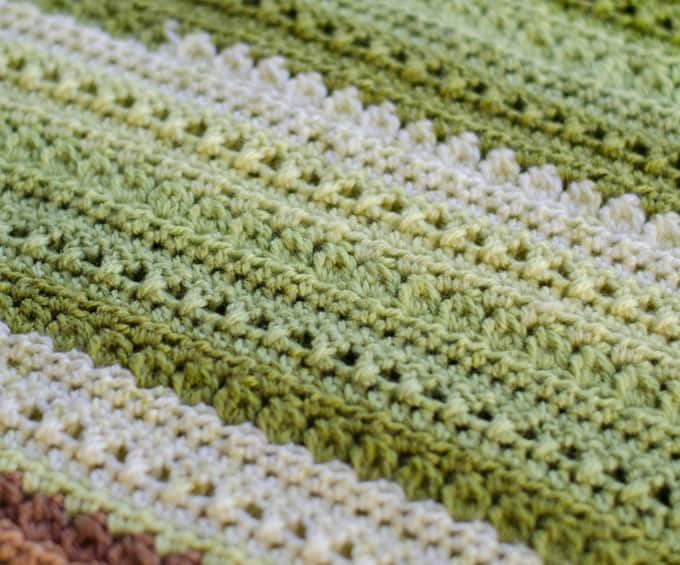 And that’s how the Fields and Furrows Crochet Afghan pattern got it’s name, just in time for spring! Of course you may like to use just one colorway of yarn or maybe even use 3 or more colorways. If you can’t just ‘go with’ the color changes, you can stop before a color change at the end of a row and start the next row with the next color. You can make the afghan wider by adding stitches in multiples of 2. Or crochet more rows if you want it longer. A lot of you have shared your photos with me on Instagram and Facebook. I love how beautiful this afghan looks in other colors! It is truly a versatile pattern. Oh the possibilities! About 1900 yards worsted weight yarn (5 Caron Cakes). Sample used 3 cakes in Pistachio Fudge and 2 cakes in Pistachio. You may wish to buy a 6th skein to use for planned color changes and the border (see notes). The ch 3 at the beginning of a DCX row DOES count as a stitch. I found it helpful to count my bobbles and DCX stitches each row just to make sure I didn’t miss a stitch. Pattern can be worked with any worsted weight yarn. For this project I started with the Pistachio Fudge yarn. When the skein ran out, I switched to Pistachio Yarn and continued to alternate until I ran out of yarn. If it bothers you to see a color change mid round, you can strategically end a color at the end of a row, cut the yarn and reattach at the start of a new color change. You may wish to buy a 6th skein of yarn for this purpose. This is also helpful to be able to find enough of one color run to work the border. 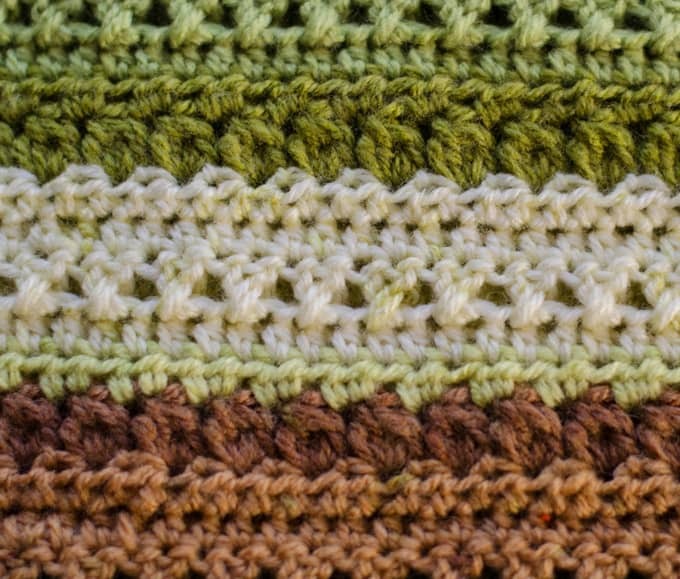 Repeat rows 2-7 for the stitch pattern until desired length. The last 2 rows should be a DCX or Bobble Row followed by a hdc row. (I worked a total of 20 pattern repeats plus a row of DCX, followed by a row of hdc.) Fasten off and weave in ends. R2: sc around, working 3 sc in each corner. I love seeing your finished projects! If you enjoyed making the Fields and Furrows Crochet Afghan, I’d love to see yours on Instagram, be sure to tag me @crochet365knittoo. If you are on Facebook, stop over to the Crochet 365 Knit Too Facebook page and share a photo! I’d love to see your work! Written pattern copyright Cheryl Bennett 2018, all rights reserved. Please do not reprint or repost this pattern. If you would like to share this Fields and Furrows Crochet Afghan pattern with others, just link to this page. If you’d like to make items for sale from this pattern, please visit my About page for more information. Third try to leave a comment here. First time told me I’m a bot?? Second time put it on another blog post. Third time, said I already asked that question……. anyway, what are the dimentions of the blanket? Or, did I miss it? Sorry you’re having trouble leaving a comment. Yes, the dimensions are in the post after the pattern notes right before the 2nd photo of the afghan on a rocker. It is 50 inches x 64 inches. You can easily make it smaller or larger if you so desire. Thank you Cheryl for the lovely crochet pattern Fields and Furrows looks very beautiful. Glad you are having good weather now spring is a great time. We will be looking forward to it once winter is over. I will enjoy making the pattern. Thanks again. Always a win when you can score clearance yarn! Hope you enjoy making the afghan! What a lovely pattern and the colors are lovely. Will definitely make this in the future, after I finish a few projects under construction. You know how that goes. Thanks for the directions. Started on this beeyoutifull pattern and I’m wondering if I missed something. Is there supposed to be a ch 1 after the bubble? Maybe that’s supposed to be understood? Yes you should chain 1 after the bobble to lock in the stitch. I revised the directions to make that clear. Sorry for the confusion! Will there be any issue without the chain 1? Should I just continue without it? I am on 2nd cakes so it wouldn’t be easy to fix. No, as long as your row is turning out even with the others, I would go ahead as you are. You probably are naturally making that loop just a little bit bigger and it is accommodating the hdc in the next row just fine. I’m sorry about that. I try so hard to get the pattern just perfect and re-read it over several times and still sometimes miss something. I hope your afghan turns out beautiful! Started this blanket 4 days ago and already 2 skeins complete. Just can’t seem to put it down, the anticipation of the next color coming up and how it’s going to look keeps me going much longer then I should. I chose the Cake Pop and Faerie Cake colors for mine. Chained 128 to make it a little smaller for a baby blanket. I’m so glad you are enjoying making the blanket! I’d love to see a photo when you are done! If you can post a photo to my Facebook page or over on Instagram and tag me, I’d love to see it! At the end of row 5 you will have one dc at the beginning, 73 bobble stitches and one dc at the end. Hope that helps! The instructions for the 2 stitches are listed higher up on the blog post under “special stitches”. I have been looking for a color change pattern for awhile, and I just fell in love with this one! 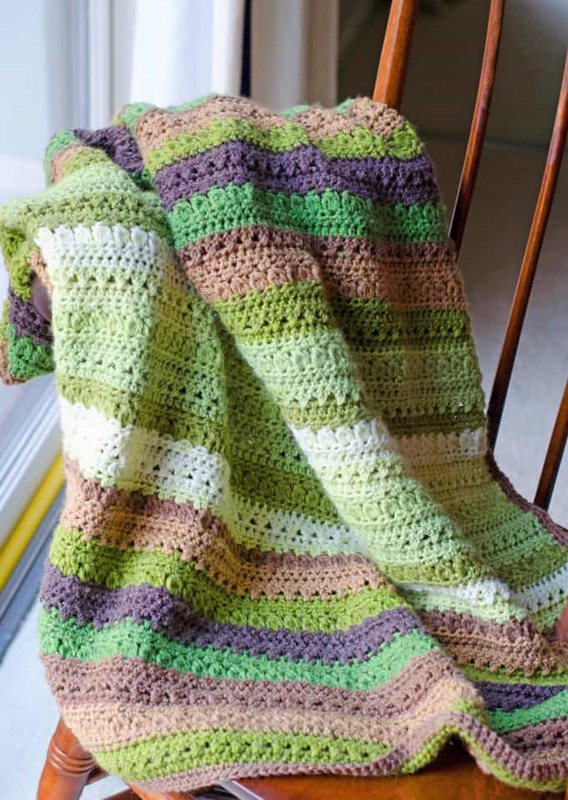 Would you happen to know how I could convert this pattern to make it a baby blanket size, please? My niece is expecting twins, and I love the idea of texture without having to change colors. I also like that this is not so lacy and full of holes like many baby blankets. The babies are expected around Christmas, and this pattern would make a nice warm blanket for them. Thank you so much for this beautiful pattern! I think this would make a lovely baby afghan! The stitch pattern is in a multiple of 2. So just determine the width of the afghan you would like and then reduce the number of chains in the pattern in increments of 2 stitches. Then crochet as many rows to get the length you desire. I would love to see photos when you are done! Love this design! Just gorgeous I definitely will be putting this on my to do list! I am in the process of making this afghan and I love the stitches. I wish I had used more muted colors though because I like the looks of yours much better than mine. I started using leftover yarn and then bought to supplement what I did not already have. Deep greens and bright pinks just do not do this pattern justice. The baby wool blanket sounds lovely. Glad you enjoyed the pattern. All the photos in the post are of the green/brown Caron cakes I indicate in the pattern. Sometimes the ads will generate something that looks like it is part of the post, but really is an ad. Maybe one of them showed you something with pinks and purples. If you are still seeing it, you could screenshot it and share it in our Crochet365KnitToo Club on Facebook and maybe the group can help you figure it out. This is such a lovely patrern, thank you so much. My oldest daughter just did a total bedroom remodel for their 25th anniversary so I’m working this up for them in turquoise, green and blue shades. *Yarn over, insert hook into next st, yarn over, pull through stitch, yarn over, pull through 2 loops. Repeat from * 4 more times, working into the same st. 5 loops are now on the hook. I end up with 6 loops on my hook instead of 5. It gives me 5 “beginnings of DC” (for lack of a better term) in my bobble. Is that correct? I can’t figure out where I’m getting my extra loop but wondering if I’m starting wrong because I end up with 2 loops after my initial trip between **. Thanks for the catch on that! You are right. Here’s the deal: The bobble can be worked either way. Either repeat 4 times and end up with SIX loops on the hook at the end or repeat THREE times and end up with 5 loops on the hook. I worked to a total of 5 loops, so I revised the pattern to show that (and the option to make the bobble fuller/puffier).